As fall quickly approaches, many people will begin to pack away their summer home and garden equipment to prepare for the next season. For individuals who like to keep their garage organized, Alliance Rubber has a product that will be beneficial, while reorganizing for the fall. The Gear Wrapz™ are made from EPDM (Ethylene Propylene Diene Monomer) material which makes the wraps all weather and very durable when in use. Ideal for bundling and securing lose items, these wraps can be reused when needed. Available in three sizes, Alliance allows you to select between 4, 7 and a 10 inch options making it possible to bundle various size objects together. For example, the 10 inch is recommended for use with larger objects, such as garden hoses and yard equipment. The 7 inch is more ideal for grouping together jumper cables and bundle ropes. Regardless of the project at hand, Alliance’s Gear Wrapz™ are a beneficial tool to utilize when trying to organize loose equipment. Wraps are available in three different sizes allowing them to work with a variety of equipment. When it comes to traveling, many people seem to go through the same procedures. First, you pack up everything that is needed for your trip. Then, many individuals will end up rushing to the airport only to stand in line at security or the check-in counter. Once at the airport, this is usually the time when people observe their baggage tag is missing or damaged. Some airlines will provide paper ones to use, but they often will not last for the return flight home. C-Line, however, has a great product that can withstand travel. The Super Heavyweight Cheer Adheer Luggage Tags allow you to make a professional looking ID badge, eliminating the need to purchase on overpriced holder. Without using heat or special equipment, laminate your business card holder or ID information in a matter of seconds. Simply peel back the protective liner, place the card inside and seal. Use the plastic attachment straps to help hook the luggage tags to your baggage. Since these holders are compact in size, store extras inside each suitcase to ensure you always are equipped. Laminate a business card or bright colored paper to help identify your luggage during your next trip. Many schools utilize a locker system to store students’ books and personal items. Locks are placed on the door handle in order to provide security for each student. If the kids forget their key, it is important for the teacher to store a spare set to ensure the students have access to their books and notes stored inside. Teachers must be organized in how they decide to store the extra keys to avoid getting them confused. Buddy has a unit that is secure, while still managing to create an organized key storage system. The 15 Key Box is a compact unit that can be stored in a desk drawer, or even wall mounted if needed. This unit, which can store up to 15 keys at one time, uses key tags to keep everything in order. Once the numbered key tags are attached to the key, the hook will allow it to securely attach to the box. Record what number belongs to which student by using the key control chart. This will create an easy reference tool in the future. The numbered key tags have a coordinating chart to help identify what each key is for. When preparing for a client presentation, it is important to pay attention to the details in order to impress. Deciding how to present the information is an important part to any meeting. Providing a hard copy of the material allows the customer to review the information after the presentation. Kleerfax Preprinted Black Leather Tabs help to elevate the level of professionalism in any meeting presentation. The dividers organize standard three-ring binder, while the tabs make it possible to locate where information is being stored. The black leather tabs are gold stamped on both sides and labeled with the numbers 1 through 31. The binding edges are 3-hole punched to allow the dividers to fit in the binder. Additionally, the edges are Mylar® reinforced to make them extra durable. These letter-size dividers will be a great addition to the next client presentation that you put together. Dividers are made of 32 pound canary stock, helping them stand-out within the binder. Many professionals use file folders to help organize and protect information. When documents are in the folders, there is no way to help make an important document stand-out or sort the pages. Tarifold has a pocket that can be utilized to store documents within the file folders to make them more accessible. The Easy Standard Pocket is letter-size and has a plastic cover that helps to protect documents. The durable outer edge provides additional protection while making the documents stand-out among the other pages stored within the file folder. Clear on both sides, the holder has a front cover sheet that should be pulled back to insert the page. The openings on the top and side of the pocket make it easy to slide documents in quickly. Pocket can fit up to 8-1/2 x 11 size documents. Use this sturdy pocket to help protect important documents, while making information easily accessible. The unique holder helps make special documents stand out within file folders. Many teachers like to have students participate in practice exercises in the classroom to help them develop their skills. Math is a subject that can require a lot of patience and practice to help students grasp the lesson. GoWrite has several dry erase products that can be beneficial in the classroom, but the Dry Erase Graph Paper Sheets are very valuable when it comes to learning math. 17 x 22 in size, the sheets have blue lines creating a blank graph that is ready to use. The back of the paper has a self-stick feature that enables the sheet to adhere to walls, refrigerators desks, doors and more. If you need to relocate the page, simply remove and reapply to another flat surface. Use dry erase markers or crayons to continue reusing the pages in the future. This GoWrite product is a classroom essential that helps students practice their skills without wasting paper. These dry erase sheets are lined in blue and have a similar layout to paper graph sheets. Almost every type of major business has some sort of a lobby or waiting room area that is set-up for visitors to use while waiting for their appointment. Many companies try to make this area as pleasant as possible by providing things to read and sometimes even refreshments. Buddy Products has an item that should be located in every waiting room. The Three-Pocket Magazine Displayer is a sleek storage unit, available in silver and black, that helps display reading material for guests without taking up too much space. The unit has three compartments with 2-1/2 inch depth to help organize and store magazines. Each pocket is slightly angled to help keep the literature upright and visible to lobby guests. The heavy duty wire and steal construction allows this unit to hold the weight of several magazines. Why not try this modern magazine display in your office waiting room! 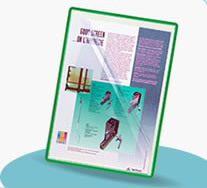 The modern style Magazine Displayer has a neutral design so it can coordinate with almost any office decor. You are currently browsing the Directly Yours Blog blog archives for August, 2014.